Since I was fortunate enough to capture over 7,000 images during a recent New Mexico trip, I am breaking these newsletters down by subject. 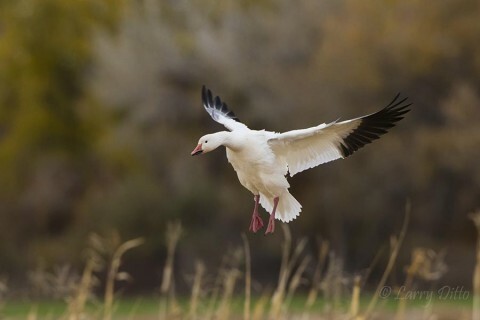 This one covers snow geese. See if you can spot what I was trying to do with compositions as I photographed geese. If you are familiar with the species, you know they tend to “swarm” a lot and seldom fall into “formations” as Canada geese do. So, I was looking for small groups and interesting wing and body positions and juxtapositions. 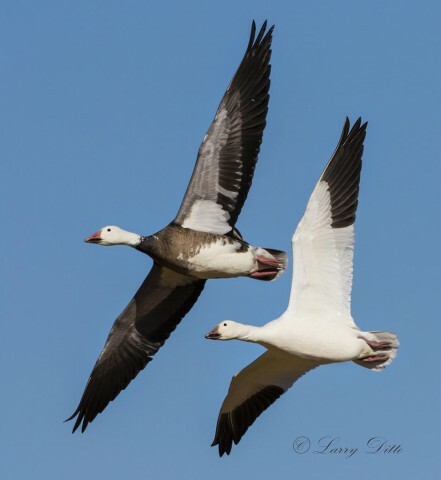 Really successful goose photography at this refuge requires a south wind. It forces the birds to land and take off into the wind which means the birds are facing into the sun and toward the photographer at the same time. That didn’t happen during our late November trip, so I had to make the most of what opportunities I had to capture images with birds flying in crossing patterns and, occasionally, landing at an angle to the camera. Click on an image to enlarge and sharpen it automatically for better viewing. Snow goose family landing in corn. The grayish birds are young from this past summer. They stay with the parents during much of the first winter. Three young have survived the migration and a few weeks on the wintering grounds at Bosque del Apache Refuge. 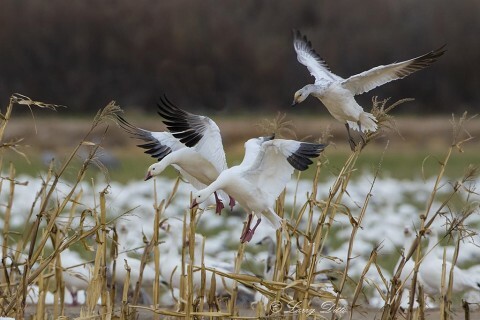 Snow geese resting on a pond during mid-day. This large flock was within 50′ of the highway at mid-day. I was able to get within 10′ of the resting birds to capture this image with a wide angle lens. Snow geese leaving a frozen roost pond at sunrise. 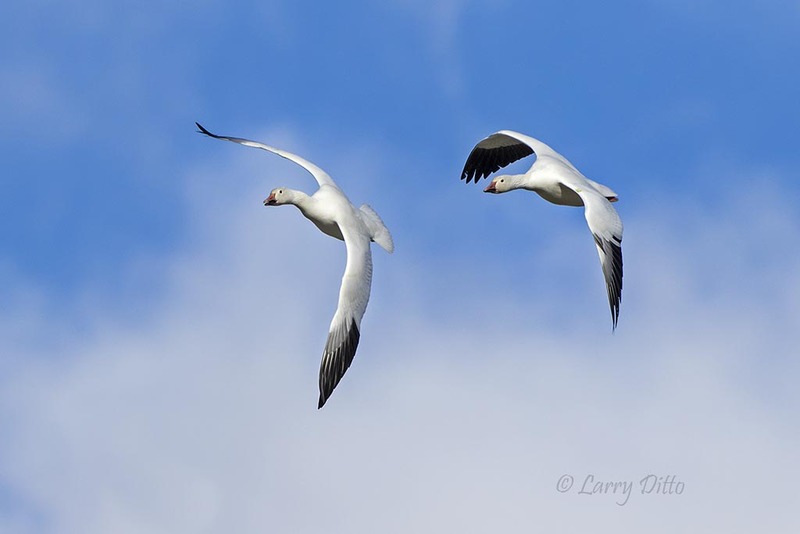 I love shooting toward the sun to capture light passing through the thin wing feathers of snow geese. Note the birds loafing on the ice (it was 13 degrees this morning). Summer weather extended into fall so that by the time we got to New Mexico after Thanksgiving, the leaves were still golden and giving us some great backgrounds. 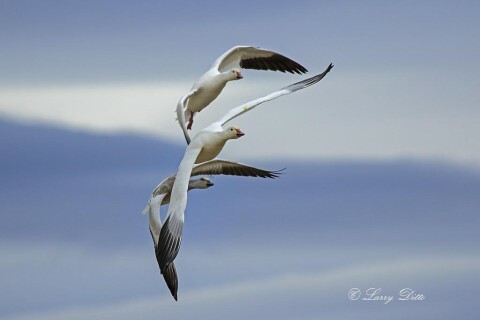 I’m always looking for birds flying together and holding the same wing position. 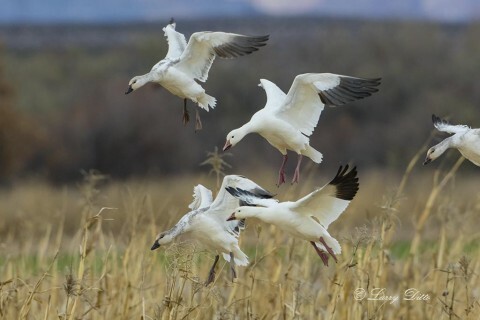 Snow Goose family in flight. Notice how much more interesting the shot becomes when the subjects are coming at an angle toward the camera. Clouds of varying color make the background more photogenic, too. 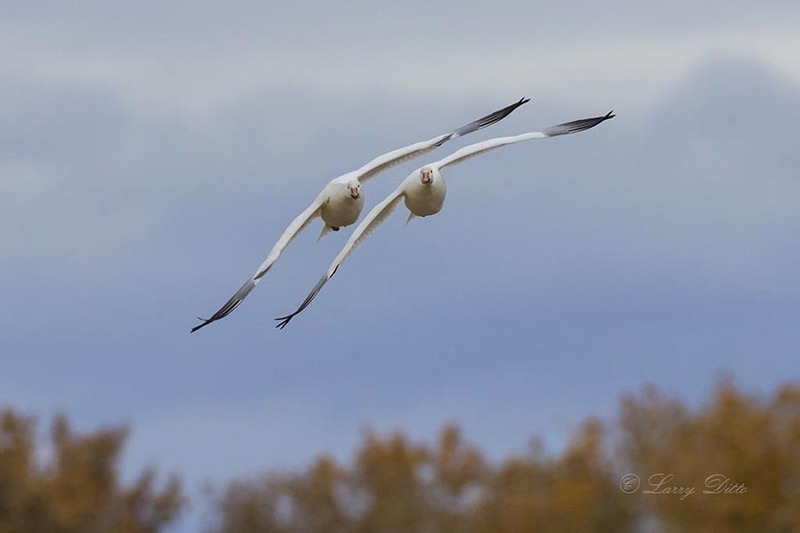 Snow Goose pair turning in flight. Snow Goose pair in flight. The blue bird is a snow goose, too. It’s the blue morph of this species and is often referred to as a “blue goose”. 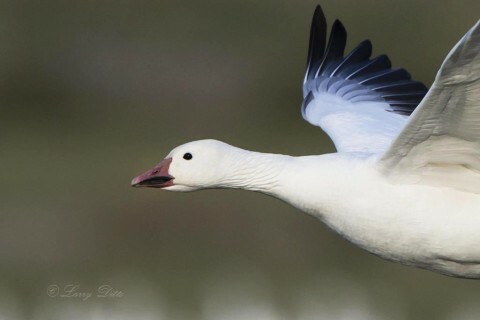 Close up of Snow Goose in flight. 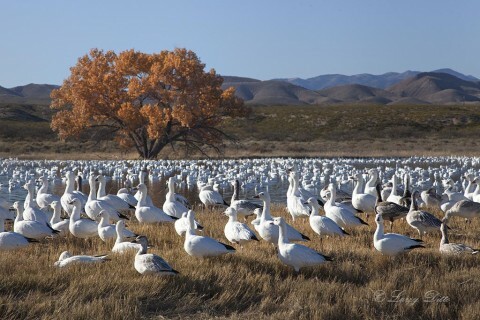 Stay tuned for more from Bosque del Apache National Wildlife Refuge.